A unique artistic adventure where magic helps to overcome handicaps. Choose the magic formula which suits you best to help us! In partnership with associations and NGOs implanted in different countries, we regularly offer both magic shows and educational workshops. The former offer a moment of happiness, with a chance to escape an often difficult daily situation, and which can help to develop positive thinking. The latter offer special moments which favour the development of individual relationships. By initializing an artistic practice which is fun yet demanding, the workshops help to restore often damaged self-confidence and leave a lasting magical impression. 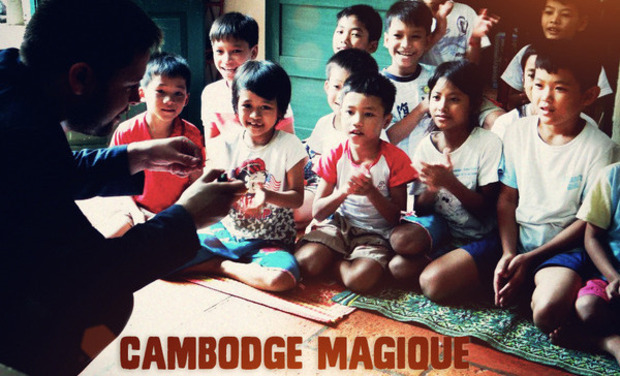 MAGICAL CAMBODIA is a novel project which mixes magic and theatre. In a country where few initiatives exist for disabilities, our magician Kimi, aided and abetted by Lulu, actress and clown, will work with children aged 10 to 17 who are partially-sighted, hearing-impaired or deaf. They will introduce the children to magic and theatre and all together they will create a theatrical magic show which will be played several times in August within campaigns promoting awareness regarding disability. An estimated audience of 500 people, mainly consisting of farming families, will attend each show. By amazing the audience, our young budding magicians will help to “dispell” prejudice regarding disability which is still very strong in the country. Taking advantage of their stay in Cambodia, Kimi and Lulu will also put on shows and hold educational workshops to be attended by several hundred street children supported by the Cambodian NGO which is their partner in this project. In conclusion, this is an original way of taking up the challenge of a handicap, an opportunity to reveal an artistic discipline which is virtually unknown in Cambodia and above all a unique human and social adventure! We have chosen to work in partnership with the worthy NGO “Krousar Thmey” (“new family” in khmer), which is the first Cambodian foundation providing aide to disadvantaged children. Working from Phnom Penh, the foundation is run by a team of 400 Cambodians and has 76 activity centres in the 14 provinces of Cambodia. The foundation looks after 1000 children full time, 2500 children on a part-time basis. It has notably installed 5 schools for deaf and blind children: more than 400 deaf children and almost 250 blind children are educated in these specialized centres. In recognition of this fantastic achievement, Benoït Duchâteau-Arminjon, founder of “Krousar Thmey” received the “World of Children Award” in October 2012, currently considered the equivalent of the Nobel Prize for defenders of children’s rights. To top it all, we are lucky to have the opportunity to immortalize MAGICAL CAMBODIA and share it with a large audience as we will be accompanied by a journalist and a photographer of renown. Thomas Salva and Olivier Lambert, specialists of videography (a mixture of photos, videos and sound) received an award at the Webby Awards 2011 (which David Lynch won in 2010) for their web documentary “Brèves de trottoirs” (“Sidewalk tales”) and also received the Grand Jury Prize at the Web TV Festival at La Rochelle in 2012 for their historical documentary “The Forgotten Night – October 17, 1961” (broadcast by LeMonde.fr). They will follow our project from beginning to end and make a documentary on disability in Cambodia with the MAGICAL CAMBODIA project as guiding line. Now, it’s your turn to show us your magical powers to help us lift the project off the ground: many thanks in advance !! - purchase airline tickets from France to Cambodia for the 4 participants in the project. - finance the purchase of magical equipment to create the show to be put on by the partially-sighted, hearing-impaired and deaf children. The equipment will remain in Cambodia after the departure of the team so that the children can continue to perform. - enable us to purchase accessories for the magic workshops to be held with street children. These will also remain in Cambodia for them to carry on doing magic after our departure.